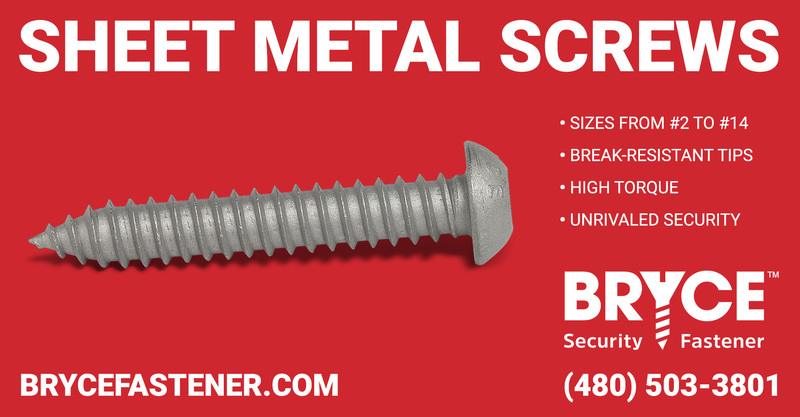 Need a sheet metal screw, with an exclusive keyway for maximum security? We carry stock in our patented, Bryce-exclusive Penta-Plus™ drive. Only the matching Penta-Plus™ bit type can turn a Penta-Plus™ sheet metal security screw, and bits are controlled through our customer database. The only more secure option on the market is our Key-Rex® design, where the keyway shape is exclusive to you. We're so confident that our bit tips will resist breakage, that we will replace them for free if they break prematurely. Standard security drives like Hex Pin are also available, but those bit tips are available for purchase at retail, so we don't recommend them for items valued over $100. Whichever drive you choose, we can make your screws in sizes #2 to #14.